In recent years, some have been critical of BBC Countryfile for its lack of coverage of British food and farming, but the four day show at Blenheim provided a wonderful opportunity to connect members of the public with farmers. Farmer and presenter, Adam Henson, along with the rest of the Countryfile team, drew huge audiences to discover more about where their food comes from. There were lots of farmers on hand each day, to tell people about cows, sheep, pigs, crops and the work they do every day to feed our nation. 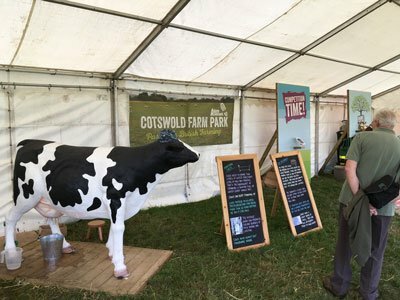 Countryfile Live provided a fantastic opportunity for me to talk to people about Free Range Dairy and the work we do to offer a more informed milk choice. It’s not often farmers get a chance to talk face to face with people who buy and consume milk and dairy products. But, when we do, there is so much to talk about. Consumers, young and old, are anxious to know that farmers and cows are getting a fair deal and many are aware of how the modern dairy supply chain is failing them. We offered people passing the Cotteswold Dairy stand free samples of semi-skimmed free range milk. An interesting exercise that proved people really can taste the difference, with many convinced they were drinking whole milk and commenting that it tasted “like proper milk”. What those used to consuming supermarket milk were tasting, was milk that came from four farms within 15 miles of the Cotteswold Dairy plant, which was then delivered direct to Blenheim for the event. There was no trucking of milk the length and breadth of the country to be poured into one big vat, processed and then shipped out to distribution depots, before it reaches peoples’ homes. Furthermore, all of the milk came from cows grazing lush green grass, Mother Nature’s ‘super food’ for cows. Back in 2006 I joined a local farming friend to help him run one of the first Open Farm Sunday events, which sees farms all over the country fling open their gates to the public every June (11th June 2017). It was clear there was a real appetite amongst the local community to know more about what farmers do and how food is produced on farms and I went on to run eight Open Farm Sunday events of my own following that experience in 2006. There is no better place for farmers to tell their story than out in the fields, standing in front of their livestock and crops. The packaging and perception is stripped back and people can find out what really defines quality and value in their food. I have always been passionate about reconnecting farmers with the people who eat what they produce and that is exactly what the Free Range Dairy Network CIC is trying to achieve today. At times it is so frustrating to find that farmers are able to produce exactly what consumers want and then see the supply chain deny them the opportunity to buy it. 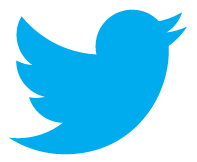 The good news is we are here to change that. We are establishing a new way of working to allow people to choose milk from cows in fields and support traditional British dairy farms. The farmers are members of the Free Range Dairy Network and is them and their cows that we seek to represent. But, we are extremely grateful to the dairies that have been prepared to give free range milk a go and who have invested so much time and energy in promoting the Pasture Promise label. By working with the farmers and their milk buyer, we can give small family dairy businesses like Cotteswold Dairy a chance to compete against the dairy giants Arla and Muller. 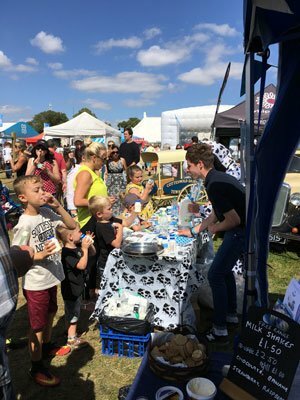 However, it is you that we really need on board – the people who came and sampled free range milk at Countryfile Live, who have signed up as supporters of the Free Range Dairy Network, who share our messages on social media, who question the provenance of their milk when out shopping. Together we can change things and all enjoy tasting the difference. So please demand a more informed choice and ask for the Pasture Promise label wherever you buy your milk.